ok , i know i already posted a pic of this helmet , but i didnt want to be hijacking someone elses thread, so im starting this for myself. pics to be added later of other works + my GSX chop when its done. 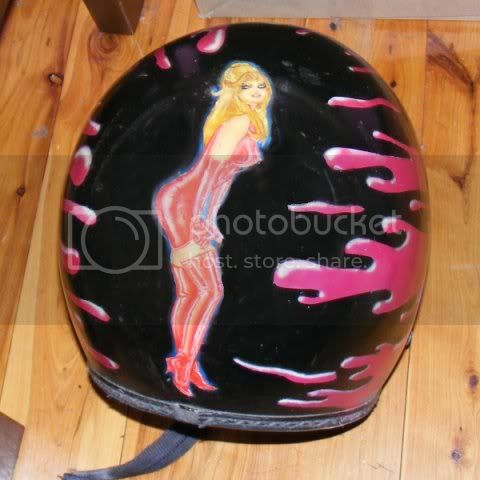 thnx Dave, it came out ok for my first tight curved surface job ( not as easy as it sounds ), i should also add that this job wasn't based around the quality of the art,( as the helmet was just an old piece of junk i had lying around with the silver compliance sticker long since removed, many paintjob colours prior ), was more of a test of the compatability between my airbrush paints , the clear coating and the fibreglass ( or undercoating of the original paint ). i'm not a painter, and by no means an expert, im just a hobby artist that taught myself how to airbrush , the hard way.